A detailed explanation of the calculation of Reynolds number in piping systems and then rotating systems were also discussed. 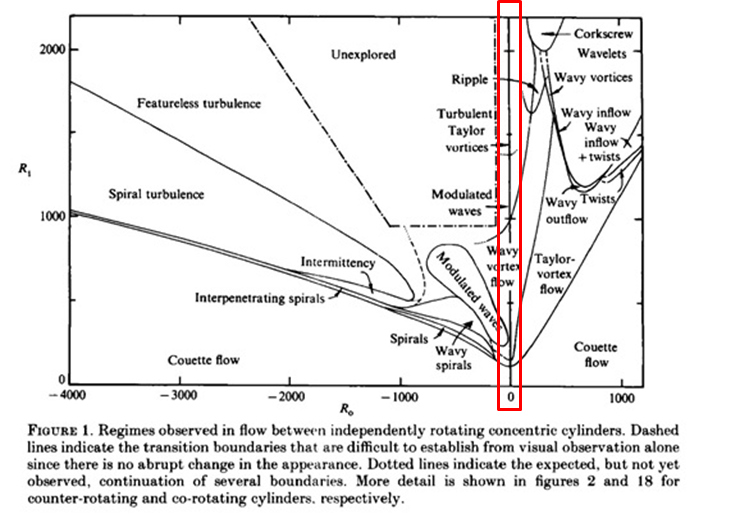 The chart below shows various rotating flow regimes such as Couette flow and Taylor- Vortex flow inside the Spinning Tube in a Tube Reactor®, or STT®. It is essentially a graph of Reynolds number calculated with respect to the outer cylinder versus Reynolds number calculated with respect to the inner cylinder. The flow regimes for two (2) independently rotating cylinders is shown. Since the outer cylinder is not rotating the Reynolds number on the “X” axis is zero. The area of concern is the flow regimes inside the red box. In a YouTube video, the STT® with a glass stator demonstrates the transition from high Reynold number, turbulent flow and Taylor Rings to low Reynold number, laminar flow and Couette flow. It also demonstrates how simplified Clean-In-Place is accomplished with the STT®. Comsol Computational Fluid Dynamics was used to model experimental runs of the Ritter reaction performed on the STT® at the EPA. Tertiary butyl alcohol reacted with benzonitrile to create N-tert-butylbenzamide. So why model the Spinning Tube in a Tube® System? implements one-of-a-kind process engineering with exceptional knowledge and experience, process safety support and superior customer service. Contact us today for your Flow Chemistry Projects!